Streets of Fire – More like a series of MTV sequences than a long-term narration, this super-thin story line focuses on a kidnapped singer (Diane Lane) and her ex-boyfriend (Michael Pare) who goes forth to save her through rainy streets, the roar of elevated subways, several alleys, and the usual warehouses. Each thrust of the story has rock music that follows along with the narration. Another fabulous movie critique with Drew and JB coming at it from 2 totally different angles. One angle is from Drew who’s seen this movie many time as a teenager when it came out, and then from JB who just saw it for the first time 28 years after it’s release date. Grab a beer and enjoy the show! Magic News Wire sponsored this episode with the movie and the beer, thanks!! 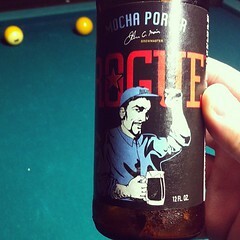 I was told to get a different style from the Rogue family and I went with the very delicious Mocha Porter.